The Sony HDR-CX405 HD Handycam features an Exmor R CMOS sensor and a wide-angle Carl Zeiss zoom lens with 30x optical zoom. The CX-405 captures Full HD 1920x1080 video at 60p and 9.2MP still images to optional media cards. The Exmor R CMOS sensor is designed for increased sensitivity in low light situations and the Optical Steady Shot image stabilization with Intelligent Active Mode delivers smooth video. 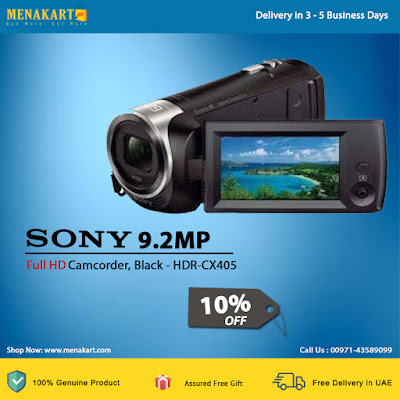 Users can monitor and playback footage via the 2.7" LCD display with 230K dot resolution.